Cabin in the Sky is a 1943 American musical film based on the 1940 Broadway musical of the same name. 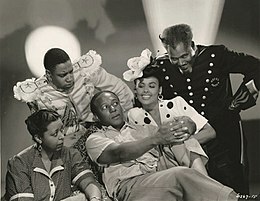 Directed by Vincente Minnelli, the film stars Ethel Waters, Eddie 'Rochester' Anderson and Lena Horne. Waters and Rex Ingram reprise their roles from the Broadway production. The film was Horne's first and only leading role in an MGM musical. Louis Armstrong is also featured in the film as one of Lucifer Junior's minions, and Duke Ellington and his Orchestra have a showcase musical number in the film. Little Joe is a no good man whose attempts at redemption are cut short when he is killed over gambling debts by big shot Domino Johnson. On his deathbed, Little Joe is restored to life by angelic powers and given six months to redeem his soul and become worthy of entering Heaven—otherwise he will be condemned to Hell. Secretly guided by "The General" (the Lord's Angel), Little Joe gives up his shiftless ways and becomes a hardworking, generous, and loving husband to his wife Petunia, whom he had previously neglected. Unfortunately, demon Lucifer Jr. (the son of Satan himself), is determined to drag Little Joe to Hell. Lucifer arranges for Joe to become wealthy by winning a lottery, reintroduces Joe to beautiful gold-digger Georgia Brown, and manipulates marital discord between Joe and Petunia. Little Joe abandons his wife for Georgia, and the two embark on a life of hedonistic pleasure. As Little Joe and Georgia celebrate at a nightclub one evening, Petunia joins them, determined to win Joe back. Little Joe fights with Domino for Petunia and she prays for God to destroy the nightclub. A cyclone appears and leaves the nightclub in ruins, as Joe and Petunia lie dead in the ruins after being shot by Domino. Just as it appears that Joe's soul is lost forever, the angelic General informs him that Georgia Brown was so affected by the tragedy that she has donated all the money that he had given her to the church. On this technicality, Little Joe is allowed to go to Heaven with Petunia. As the two climb the Celestial Stairs, Joe suddenly wakes in his own bed. Joe had not been killed in the initial gambling-debt fracas, only wounded. All his supposed dealings with angels and demons were only a fever dream. Now genuinely reformed, Little Joe begins a new, happy life with his loving Petunia. Rex Ingram as Lucius / Lucifer Jr. According to liner notes in the CD reissue of the film's soundtrack, Freed and Minnelli sought input from black leaders before production began on the film. The script was submitted before production to the NAACP. In a letter to the Editor, a writer of the film said he received a letter "congratulating [them] on the treatment of this black fable, which avoided cliches and racial stereotypes." "Things Ain't What They Used To Be"
One musical number, in which Horne sings a reprise of "Ain't It the Truth" while taking a bubble bath, was cut from the film prior to release, though it later appeared in a 1946 Pete Smith short subject entitled Studio Visit. As Horne later said in the documentary That's Entertainment! III (1994) in which the excised performance was also featured, it was felt that to show a black woman singing in a bath went beyond the bounds of moral decency in 1943. A second (non-bubble bath) performance of this song by Louis Armstrong was also cut from the final print, resulting in the famous trumpeter having no solo musical number in the film. Armstrong's recording of "Ain't it the Truth" survives and is included on the CD. At a screening of the film, Showmen's Trade Review gathered and listed possible ideas for theaters to promote the film. Newspapers and radios were encouraged to hold contests where viewers were to submit: dreams, recipes that use inexpensive ingredients, the furnishing and construction of their ideal "Cabin in the Sky," and incidences with "luck charms." A "Go to Church Sunday" campaign included offering discounts on tickets for congregations to bring in new worshipers. For the stage, choral groups or amateur night with comedy, singing and dancing night were suggested. For the lobby, a trio of boys singing and dancing where boys could throw large, 12 inch square dice. To play on Eddie Rochester Anderson's difficulty with his necktie in the film, it was suggested to borrow mannequins and hold a tie tying contest where the top ten fastest contestants gain free admission. While the article did suggest that these activities were held using people of color, it closed out by emphasizing that focus of an all-black cast should not be used as the main selling points as it would sell "through confidence that it will be enthusiastically received by [the] customers." In the 1940s, movie theaters in many cities, particularly in the southern United States, refused to show films with prominent black performers. On July 29, 1943 in Mt. Pleasant, Tennessee, the film was pulled after the first 30 minutes on orders from the local sheriff. A crowd gathered outside the theater and someone threatened to "pull the switch." The film was nominated for an Academy Award for Best Original Song for "Happiness Is a Thing Called Joe" sung by Ethel Waters. According to MGM records the film made $1,719,000 in the US and Canada and $234,000 elsewhere resulting in a profit of $587,000. After years of unavailability, Warner Home Video and Turner Entertainment released Cabin in the Sky on DVD on January 10, 2006. ^ Higham, Charles; Greenberg, Joel (1968). Hollywood in the Forties. London: A. Zwemmer Limited. p. 172. ISBN 978-0-498-06928-4. Wikimedia Commons has media related to Cabin in the Sky (film).